Right after sending my mil to the gate, Sofia started crying. And she cried all the way until the carpark, into the car where I immediately nursed her. Iz dropped us home and went straight to work. I was nursing Sofia when I realized her body was warmer than usual. Mum came to check and said memang panas betul ni. Her temperature was high, 38°C. Memang panas. Kepala, tangan, badan... And that was when I realized, ya Allah, I really love this kid. After finally getting her to sleep, while praying, I actually cried. Sedih. Even thinking about it now makes me sad. I just realized I love this kid so much. Told my best friend about it and she laughed. How can I not love my own child? "She came out from your vajayjay kut. Okay you caesar but still, near enough." Okay. Maybe I did love her a lot. Eh apa pulak. OF COURSE I love her a lot. Maybe I just don't realize it. The hustle bustle of changing diapers, nursing, bathing, clothing, playing, and basically taking care of her every single minute made me overlook this deep feeling I had towards her. And when the time finally stops, and I get a moment to think, then only I realized man I love this kid so much walaupun kadang-kadang menyusahkan. Yes I'm going to be honest, sometimes I do feel like it's a nuisance. Nak makan kena cepat, mandi kena cepat, buang air besar (sopan betul penggunaan bahasa ni) kena cepat. Honestly, memang rasa rimas. But I just get to realize that no matter how much a nuisance this kid can be, deep down I really love her. And I know Iz loved her as much as I do. He checked her temperature every hour until he fell asleep at 2am. And at 5am he woke up again. Sofia has been a tough baby. Smiling and not crying much eventhough her body was warm... She only wanted to be hugged and carried most of the time. We put a wet towel on her head and still gave her medicine. Such a cute kid. Demam also cute. everyone loves their kids. hehehe.. Musim demam kot sekarang. FL pun baru je baik demam. Alhamdulillah.. sofia baru nak masuk 6 months, still a long way to go. Aa. Mek pun rase benda yg same. Yela me time kena bhagi bhagi dah. But mek do realise (Allah bg kena jugak supaya tahu) bila mek takot giler time tu (scary kalau ingat balik). Peluk Amani erat giler and she just smile :) All the frighten gone and suddenly rase ok je nk face the things. Ya Allah, ank kan? Your girl memang bambam la bash ! Hahahhaha! Memang... Pipi tu semua orang cakap macam pau! hahaha of course lah sayang. kekadang tak perasan babe. 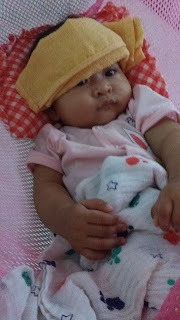 masa baby dulu i selalu macam takleh terima I dah jadi mak orang, lepas tu I macam confuse perasaan sayang tu mcm mana.